You are here: Home / Practical Uses / Wireless Doorbell: Add a Doorbell Anywhere, Fast! Did you move into a house that doesn’t have a doorbell? Do you live in an apartment and wish you had a doorbell? Do your neighbors like to use a side door that doesn’t have a doorbell? A wireless doorbell is a fast and inexpensive way to add a doorbell, anywhere, without needing any wiring or hiring an electrician! We were probably in our current house a little over a year when, one night, there was a loud banging on the door to the garage. It was dark outside and I was home alone with a young baby. The banging sounded urgent. Realizing I had left the overhead garage door open I began to get concerned. I’m not sure if it was the newness of the house or the fact that I was startled out of my thoughts, but I began to get scared. I decided to cuddle up with my little guy and pray they went away. (There also may have been a whispered phone call to my husband, who was at work at the time.) Finally, after some terrifying moments, the banging stopped. Well, the next day, my neighbor told me her son had stopped over to drop off our mail they’d received. Apparently I was upstairs and hadn’t heard him knocking so he knocked louder on the door. Yea, that makes sense. Oops. 🙂 After that my husband bought me a wireless doorbell and we now have a doorbell by the door to the garage – no more scary banging. 🙂 The wireless doorbell was an inexpensive solution and so fast to install! If you’re looking for a quick and inexpensive way to add a doorbell check out a wireless doorbell like this. Note: You may also be interested in this post on how to create a DIY charging station with a USB hub. dinner bell? Put the button by the stairway and the receiver in the kids’ rooms to alert them when dinner’s ready? 🙂 Ok, maybe not. Wireless doorbells are made of two components. The button that is mounted outside the door (transmitter) and the part inside that plays the door chime (receiver). The two communicate with each other like the way your garage door opener remote talks to the garage door opener motor. Therefore, there is no need for any wiring. Note: Check out our post on how to fix a WiFi deadspot. The best part about a wireless doorbell is how easy it is to install! There is no wiring what-so-ever! All you need to do it provide power to both parts of the doorbell, the transmitter and the receiver. The doorbell button for this unit is powered by a battery. The receiver (or door chime) is plugged into a regular outlet for power. The transmitter runs on one battery, which is included. Install the battery. Find a location where you’d like to place the door chime (receiver). With a range of 500ft you can locate it almost anywhere in an average sized house. Plug the receiver into an outlet. Test the doorbell by pressing the button on the transmitter. Using the button on the side of the receiver, adjust the volume if necessary. Using the other button on the side of the receiver, select the door chime you’d like. (This YouTube video plays all the chimes available on this wireless doorbell. Next, go to the location where you’d like to mount the doorbell button (transmitter). Decide if you’d like to mount it with screws or with double sided tape (both screws and tape are included in the package). The unit is so light that I decided I didn’t need to mount it with screws. However, instead of using the double sticky tape I used a command strip (because I LOVE them and they give me the ability to remove the strip if I change my mind about a location). Attach your doorbell where you want it. Note: Like movies? Check out these places to watch movies online for free (safely and legally). I do love gadgets! But I’m also frugal. This little gadget isn’t super complicated or techy but I love it. It serves our purpose exactly, it works as expected and it was relatively inexpensive. Perfect! 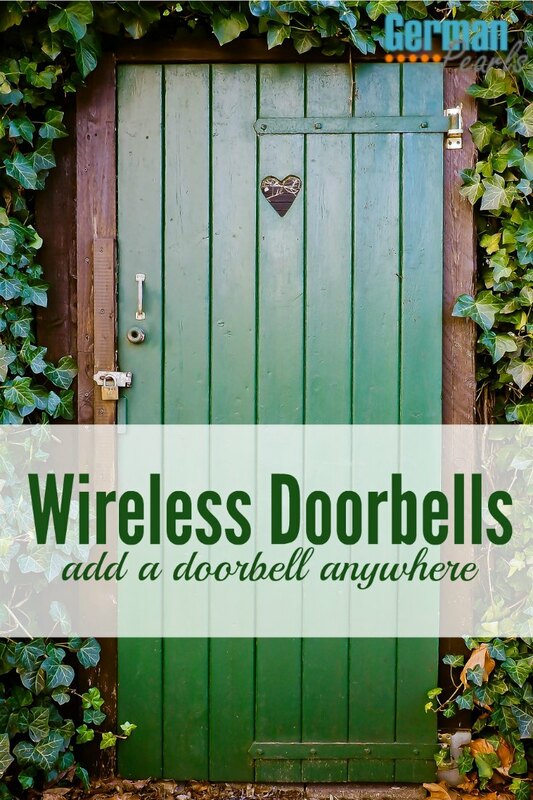 Have you had a chance to use any of these wireless doorbells? Leave a comment below – I’d love to hear how you used yours. We got one of these for a house with a sunroom where we could never hear visitors. It worked great after we memorized which of the three different tunes went with which door. Here’s a tip. 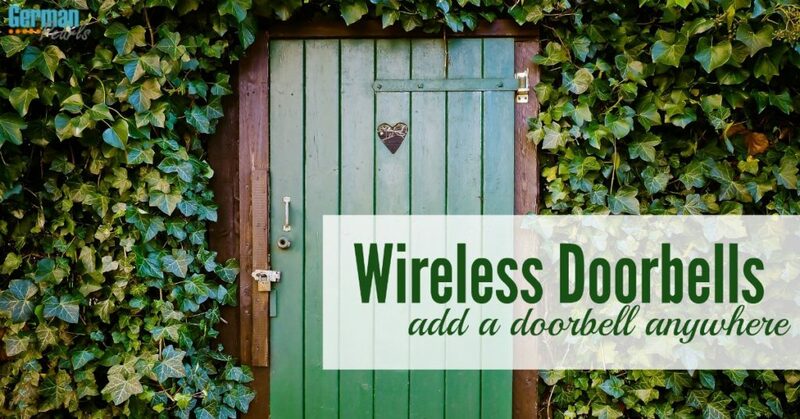 Don’t disable the old doorbell system, just swap the old front door push with the new wireless push. That way when you sell the old house, you can take the wireless system with you and your buyers still have a doorbell. Good tip – I wouldn’t have thought about that. I too would be scared if I heard loud banging on my garage door. No thank you lol. I’m happy you installed a doorbell. I don’t have one right now(and knocking on my front door can be alarming when I’m home alone) , but I may give this a try, because it seems easy. It was very easy! Good luck!